1st Gear: Chevrolet Volt = Ford Escape Hybrid? Wired says says GM insiders think Chevrolet can sell 20,000 Volts this year. If it can get there, and there's definitely no guarantee, GM will achieve the same level as the peak year for the Ford Escape hybrid, something much more modest than it originally set out to do. Escape hybrid sales were best in 2007 at around 21,000, and Ford finished out 2011, the last year for the Escape hybrid, with just over 11,000 sales (there may still be some floating around out there). In all, Ford sold about 122,000 Escape hybrids from 2004 until it was discontinued. (There is no hybrid version of the 2013 Escape.) During those years, the Escape hybrid gave Ford some environmental bragging rights, but I don't remember it ever claiming to be the silver bullet that the Volt was supposed to be for for GM. Of course, GM has scaled back on expectations for the Volt, saying it just wants to match supply with demand. There's always the chance its sales go could well past the best year for the Escape hybrid — certainly, GM was once talking about sales of 60,000 Volts a year. But wouldn't it be something if, after everything that the Volt was made out to be, it doesn't do much more for GM sales than the Escape hybrid did for Ford? The New York Times says Greek's New Democracy party, which favors keeping the Euro as Greece's currency, looks like it will get to form a coalition government. Now comes the hard part: coming up with a plan to save the economy. I took a look for Forbes at what scares the auto companies most. Basically, it's the spillover effect. If you think about any of the economic meltdowns of the last couple of decades — Brazil, Mexico, Thailand — the auto industry always bears the brunt. Sometimes, neighboring countries can be affected as well, especially if workers from an ailing economy live elsewhere or send money back home. Now, let's be honest: the Greek auto industry is just a blip on the European market. There hasn't been a car built there since 1995. But, if the Greek economy can't be resurrected, even what's left of auto sales could vanish completely, and that could bleed over into other European economies. So, there will be plenty of fingers crossed at global carmakers as New Democracy starts to cajole. Jalopnik reported this weekend on Toyota's amazing crash at Le Mans. What you might not have heard is that Toyota brass and crew members went to Nissan to apologize in person for a second crash that took out the Deltawing (Highcroft Racing posted this Twitter photo showing the scene). After the last few years, apologizing comes pretty naturally to Toyota, but not everyone thought graciousness should have been the order of the day. "Seriously amazed at the disastrous effort for @Toyota_Hybrid at #LM24," tweeted Colum Wood, the editor of AutoGuide.com. "I hope Akio (Toyoda) slaps someone." It might not only be the Le Mans team. 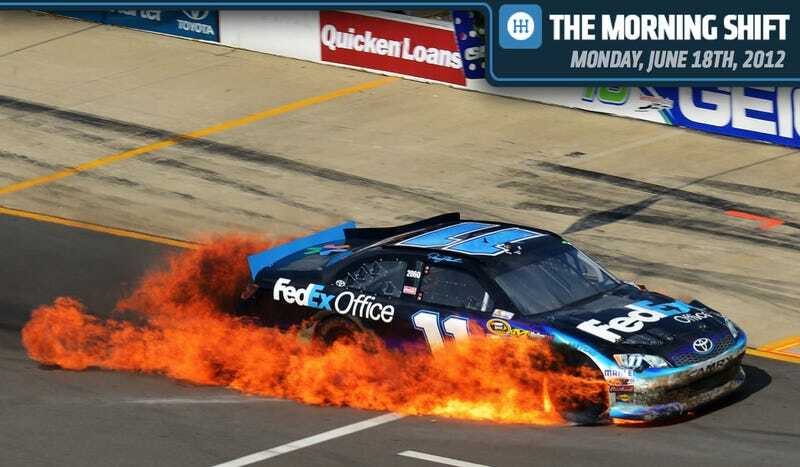 USA Today reports Denny Hamlin finished the Quicken Loans 400 at Michigan International Speedway in spectacular fashion with his Camry on fire. In fact, the three Toyotas driven by Joe Gibbs Racing team members Joey Logano, Kyle Busch and Hamlin finished out of the top 30 at MIS. The Orlando Sentinel reports on the aging car trend and what buyers are doing to keep their cars in shape. The average age of a car on the road is now 11 years, according to R.L. Polk & Company. Market-research company NDP Group found 19 percent of drivers report owning a car that's 15 years old or older, compared with 14 percent five years ago. There are a whole bunch of reasons why this is happening, including the fact that cars and trucks are simply lasting longer. But one makes real sense: the average car loan is now six years, and many owners want to have a few payment free years before they borrow on another vehicle. Huffington Post reports that while many people are seeing their jobs wiped out by technology, there's a series of professions where that won't happen. Several of them have direct connections to the auto industry. HuffPo's list of 10 safe(ish) jobs include managing automation (somebody has to keep an eye on those computer screens), lawyers and financial analysts, and jobs related to the environment, such as the watch dog organizations that keep an eye on polluters. On this day in history in 1923, Checker Cab built its first eponymous taxi in Kalamazoo, Mich. Checker began building taxis in Joliet, Ill., the year before and some of its taxis were already on the streets of New York. But its founder, Morris Markin, decided he wanted a bigger factory. He took over buildings that had been used by the Handley-Knight Company and the Dort Body Plant. The Kalamazoo factory had 700 employees on the day its first Checker Cab rolled off the line. Checker manufactured vehicles in Kalamazoo until 1982; it still owns taxi fleets in Chicago.